In today’s fast-paced world of rapidly-changing technology, it is more important than ever before to have the proper tools in place to take your packaging to the next level. Traditional label designs and printing processes are continually evolving by implementing cutting-edge digital technology in order to keep up with the instant gratification now desired by consumers. Because of this, it is crucial to incorporate these new and innovative ways for your target audience to connect with your brand. One of the most popular ways of accomplishing this is augmented reality (AR), a method in which interactive content is used to tell your story, bringing your traditional pressure sensitive labels, shrink sleeves or flexible packaging designs to life. Seeing is believing! How does AR work, exactly? Glad you asked: here, we will take you through a step-by-step overview of the process to see exactly how this new and trending technology in the printing and packaging industry can work to your advantage today. Additionally, check out the video below for more information on the subject. Don’t miss out—the future is now! By including an icon and text on the artwork of your label that instructs your customer to download a free AR app, they are able to quickly and easily gain access to the tool they need to experience the curated content that awaits them. Incorporating these small and unobtrusive elements into your design will show the customer that there is more to the packaging than meets the eye and gives them the guidance necessary to get started with their phone or tablet. When your customer first scans the label artwork with their device, they are able to instantly see the interactive elements that you have hidden in your otherwise-conventional packaging. The content can range anywhere from an embedded product or company overview video to buttons and links taking them to your website or ecommerce page. The ability for people to directly interact with your brand on the store shelf—or after they have purchased your product—is something that is unique to AR. The ability for a prospective customer to engage with your product before it even leaves the store is a silent salesman like no other. From the moment the consumer’s phone scans the artwork, they are immediately engaged and fully focused on the story you are telling them. The message of that story is crucial, because if they have not already purchased your product, there is now a higher likelihood of their doing so. If they have already purchased your product and are showing continued engagement by utilizing the AR feature of your packaging, then there is a good chance they will share their positive experience about your brand through social media or word of mouth. Free advertising at its finest! Always keep in mind how crowded with your competition the marketplace is. For a customer to choose a product in today’s saturated marketplace online or in-store, something needs to grab their attention. In order for them to actually relate with your message, your packaging truly needs to stand out from the crowd. After a customer has interacted with your AR content, if your messaging is effective enough, they will have a greater understanding of what your company and product are all about—and the value they offer. The conversion of your packaging from a standalone label to an interactive package will lead to the conversion of your customer from a simple prospect to a loyal brand follower. This can be achieved by thinking outside of the box—literally. By going above and beyond what has traditionally been an exercise in visual appeal, adding AR to your labels, shrink or flex pack breathes new life into your brand and product line. Your plain packaging levels up by staying ahead of the crowd and moving towards the future of product packaging with living labels. Bring your packaging to life! Century Label is ready to help you take your traditional label and implement AR into your next print project with us. Our AR services are available as an add-on feature, and we can guide you on the best way to incorporate this technology into your existing artwork. Why should wine sellers start paying more attention to millennials? The wine industry generates about $62 billion every year, and millennials account for about 42% of wine sales. This is far too big a market for any wine company to ignore. Unlike previous generations, millennials grew up with much easier access to wine. Not only are millennials more likely to purchase “cheap” wines like canned wine and bag-in-box wine, but they are generally more willing to go farther and spend more on imports, special blends, and exclusive runs of limited-edition wines. Modern millennials who enjoy wine are not following the “traditional” wine marketing methods; they spend more time looking at influencer content on social media. Instead of long-winded reviews from sommeliers and text-rich newsletters, millennials are more likely to pay attention to concise advertisements that get the point across quickly. Social media is absolutely crucial. Millennials prefer companies that offer adventure, human connection, and good stories. Millennials are also more concerned with intrigue and adventure over expense and the appearance of luxury. Many California wine sellers report that their millennial customers aren’t interested in the expensive and exclusive vintage bottles; they’re more interested in something different than the usual handful of the most popular varieties. On top of social media marketing prowess, authentic advertising, and making personal connections through label branding, wine sellers also need to focus on aesthetics—namely, wine labels and marketing that grab millennials’ attention. Research shows that front pack labels are the primary factor for a customer to determine the value of a product. One study using a group of millennials in Portland, Oregon found that these customers responded best to features such as label texture, colored sealing foil, label and bottle colors, font, simplicity, and iconography when choosing which wine to purchase. The study found that wine bottles millennials thought offered the best value had de/embossment features on the label. Bottles millennials thought were “fine wines” were heavier, used foiling, and had textured labels. Other research on which wine labels pop most to younger consumers found that bright colors–such as reds and oranges–are most attractive, along with other unique elements such as clever, creative, and stylish images. One study resulted in Twin Fin wine voted as the “Most Attractive.” The bottle boasted a colorful photo of a convertible on the beach, along with a bright orange cap. The more colorful and interesting the label, the more it stands out to millennial wine shoppers. Women in particular prefer creative and eye-catching wine labels, while men responded more robustly to plain and less-colorful labels. Wine sellers can use this information to target a certain audience. Furthermore, millennial survey respondents said that descriptions of aromas and flavors are the most important information to include on the back of a label. Awards the wine has won and climate information can also increase the odds of making a purchase, as could a romantic story of the wine’s origins (although this factor fell low on the list). Many wine companies are using even more dramatic marketing methods with their labels. Incorporating humor has become increasingly effective for some brands, while others are using augmented reality as a way for consumers to interact digitally. Ramping up your labeling and related marketing efforts will grab the right kind of attention from the shelf. A decade or so ago, many wine sellers could count on their usual varieties comprising the lion’s share of sales. Basic, safe choices typically made up about 70% of an average wine company’s sales, but that number is dwindling rapidly. Now, basic wine offerings may only make up about 30% of sales because millennials aren’t interested in the usual fare that was popular a decade ago. Millennials are making more adventurous wine selections. They want imports and exclusives, and wine sellers all over the country are taking notice. Previous generations may have relied on wine critics to make their wine-purchasing decisions, but that is not the case for millennials. Modern wine companies need to offer something new, enticing, and adventurous to capture the attention of a young but very discerning market of wine lovers. They prefer authenticity over pretentiousness and often go right to the source and connect with wine companies, distributors, sommeliers, and social media influencers directly. Modern wine marketers need to capitalize on this audience to capture the massive market share of the wine industry that millennial customers command. Millennials are not like previous generations that valued their wine based on the price paid for it. Marketers can succeed by showcasing sustainability, authenticity, and offering robust backstories to their smaller runs and cheaper wine offerings. The team at Century Label is ready to help you take your vision and apply it to your products. We will offer guidance to ensure that the proper high-quality printing techniques are used in order to preserve the integrity of your brand. Our customer care specialists are standing by to make sure every order is exactly the way you imagined it, meeting your expectations. Request a quote today to get started on your own quest for wine label branding success. 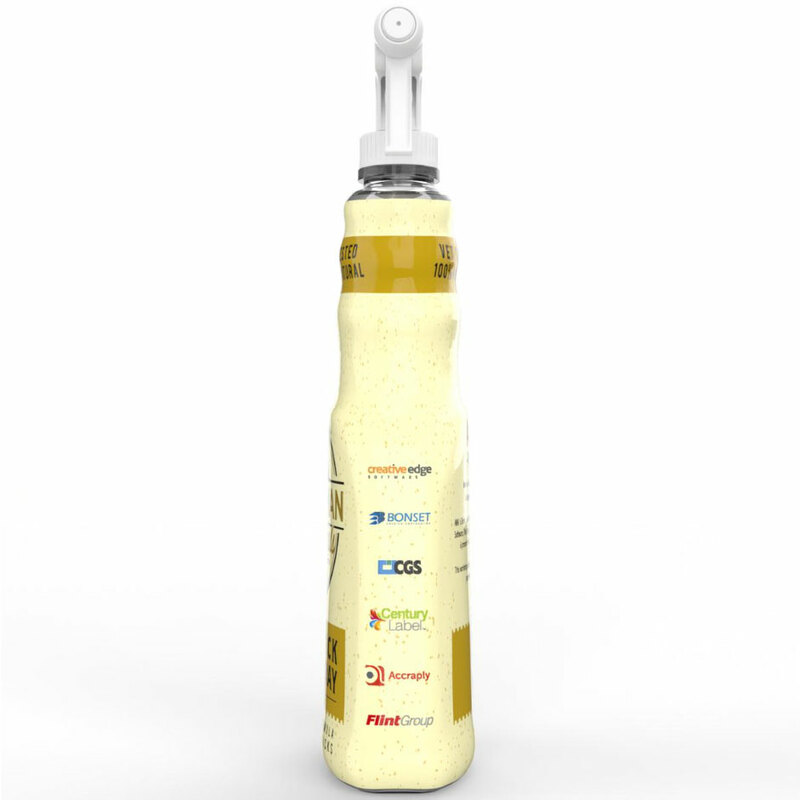 View the 3D proof of the spray bottle shrink sleeve. Century Label will exhibit their award-winning shrink wrap products at the 2018 Alexander Watson Associates (AWA) Workshop in Minneapolis, Minnesota. The theme of this year’s workshop, which will take place on November 13th and 14th, is “Introduction to Heat Shrink Sleeve Label Technologies in 2018.” Century Label VP and general manager Todd R. Frendt and digital production supervisor Bryce Schwab will represent Century at the 2018 AWA Workshop. Century Label is proud to be the supplier of shrink film for this workshop, which aims to improve participants’ understanding of heat shrink sleeve label production and application through interactive guided activities. View the 3D proof of the drink bottle shrink sleeve. “As a significant player in one of the fastest growing markets in our industry, we continually look for the latest technologies in shrink sleeve printing and application that will differentiate our value proposition from others,” says Frendt.